* Lifetime registration number listed within our database. Your information and registration number will be stored within our secure database until requested by the owner/handler to be removed. 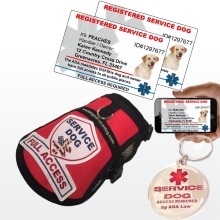 * A custom registration identification card complete with your dogs photo and your information. 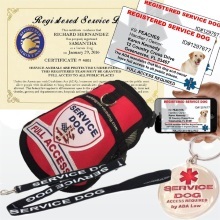 Having a official Service Dog Identification Card will make it easier for you to identify your dog as a working dog thus making your daily travels easier. * A premium vest with a high quality Service Dog patch sewn on. A vest is an important piece of equipment as it immediately identifies your dog as a working dog from a distance. 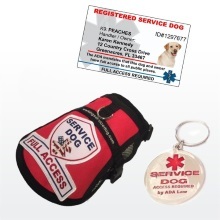 * A Service Dog collar tag is yet another form of identification to inform the public that your dog is working. Service animals are dogs that have been individually trained to perform a task to assist a person with one or more disabilities. There are many forms of disabilities and many ways that dogs can be trained to perform tasks to assist their handler. 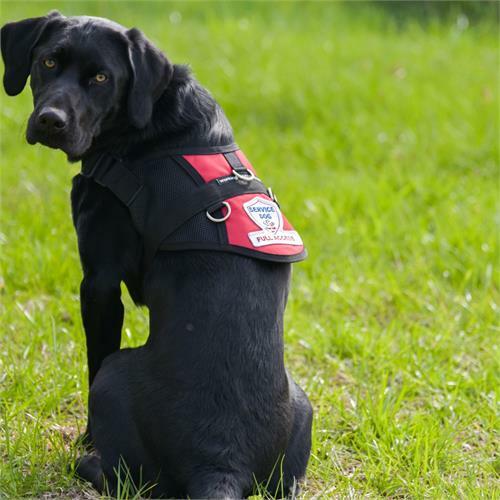 For a person to legally qualify to have a service dog, Federal Laws state that he/she must be considered disabled and the dog must be trained to perform a task for them. This right takes precedence over all state and local laws which might otherwise prohibit animals in those places such as Stores, Malls, Restaurants, Hotels/Resorts, Airlines,Cruises, Taxi cabs and Buses just to name a few.